To order from Large Print Books Ltd please call 08081 727475. 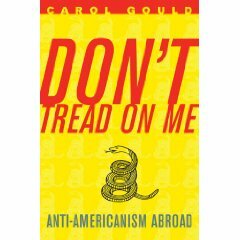 Carol's non-fiction book, 'Don't Tread on Me -- anti-Americanism Abroad,' may be ordered from USA Amazon.com. Carol Gould is not just one of my favourite authors, but one of my favourite people. It is safe to say that warmth, wit and wisdom are qualities particularly well-represented among Americans and Jews, but even by these high standards she�s a star. As I discovered a few months ago, she is also a formidable debater. Don�t be fooled by that sweet smile, opponents. I�m writing this post because she has written a fantastic book called Don�t Tread On Me: Anti-Americanism Abroad. It is a 21st century J�Accuse against the growth in anti-Americanism and its vile, incestuous sibling � antisemitism. The book is so much more than that, though. It is also a personal celebration of all that is great about America and Americans, a charge-sheet against the hypocrisy and envy that underpins the prejudice against them and a personal journal of a brave, plucky woman in strange times. Our Editor also appeared on a lively one-hour Press TV programme, 'The Agenda,' hosted by Yvonne Ridley; we discussed the Nobel Peace Prize being awarded to President Obama. On the panel were Robert Oulds of the Bruges Group (this is the think tank created by Margaret Thatcher and Freddie Forsyth) and Sukant Chandan. Sukant told Robert and Carol off-screen that he thought Hitler had had some good ideas and that Britons should 'let it go' regarding our victory in World War II. Listen to Radio Four's 'Sunday Programme' about the Egyptian revolution and how it affects Israel and the USA. It is a novel about the women who flew during World War II for Air Transport Auxiliary and explores issues of anti-Semitism and racism during wartime . PLEASE NOTE CAROL'S NOVEL, 'Spitfire Girls' CAME OUT IN MAY 2009 FROM RANDOM HOUSE UK. She has also written for The Guardian, National Review Online, World Jewish Digest, The Weekly Standard, Pajamas Media, Front Page and New Media Journal USA. 1. The young men and women who work in the studios are keenly interested in my point of view. On Sunday 14 November at 13:30 GMT on 'The LINK' on Press TV (UK channel 515 on Sky) an audience in London and a gathering of the homeless in Washington DC joined in a heated discussion about the fate of the homeless and repossessed of all social classes in Britain and the United States. Our editor, American author Carol Gould ('Don't Tread on me : anti-Americanism Abroad') in London and journalist Roger von Hanwehr in New York joined the fray moderated by Joobin Zarvan in Teheran. Carol most recently appeared on the BBC World Service on 31st October and on Sky News 2 November. Our editor, Carol Gould, appeared at the Spiro Ark on Wednesday evening 3 March 2010 at discussing her two books. She also appeared at the Middlesex University Literary Festival Trent Park 23 March 2010. Carol Gould appeared on Press TV hosted by Andrew Gilligan in 2009 and on BBC Radio Four's 'Any Questions?' on November 6th in Hartlepool, England with Vince Cable MP, Caroline Flint MP and Jeremy Hunt MP. Our Editor, Carol Gould, was a panellist on 'Any Questions?' hosted by Jonathan Dimbleby on BBC Radio Four live at 8PM Friday 22 August 2008 from Billericay, Essex. Hillary Clinton has denied contemplating defeat in her White House bid, after analysts believed she had admitted looming failure. On Thursday night, the senator paid a generous tribute to her Democratic rival Barack Obama - saying she was honoured to be there "no matter what happens" - following his 11 straight wins in nominating contests. This prompted some commentators to claim the valedictory tone of her speech proved she was about to quit her quest to be the first woman president. But speaking at a rally in Dallas, Texas, she has hit back, saying: "This is going to be a spirited election between now and March 4. I am thrilled at the depth and breadth of support I have across the state." Debating on Sky News whether Senator Clinton could have executed her campaign in a better way, US journalist Carol Gould said she would have told her to keep former president and husband Bill out of the limelight. "He has in many ways antagonised the crowds," she said. "I have a feeling that he's gone off on a tangent. He's often in places where she isn't. "I hate to say this, but she should have had better control over him." Yet Ms Gould also admitted: "We can all have 20:20 vision in hindsight. I think that they had such a shock when they lost Super Tuesday. "No one would have thought they would have lost Super Tuesday in such a spectacular way, and they didn't really have a game plan after Super Tuesday." Meanwhile, presumptive Republican nominee John McCain has been attempting to shrug off news reports that have connected him to corporate lobbyists and one, in the New York Times, that suggested he had had an improper relationship with a female lobbyist. Other publications followed up the NY Times story with accounts of their own of McCain - who maintains a clean political image - in close ties with lobbyists. The White House, which has mostly stayed on the sidelines in the presidential race, has come to Senator McCain's defence, suggesting the NY Times is biased against Republicans. "I think a lot of people here in this building with experience in a couple campaigns have grown accustomed to the fact that during the course of a campaign... The New York Times does try to drop a bombshell on the Republican nominee," said White House spokesman Scott Stanzel.